Buffet's MidAmerican Solar bought the project from SunPower  for $2 billion in January, and SunPower is developing it using its own panels. 650 people will be employed to build the project on 3200 acres, and in 2015 it will begin providing power to 400,000 homes. It is one of several large solar projects being built in the area of Lancaster,  the first city to require solar on all new homes. In January, MidAmerican Solar purchased the project for $2 billion. 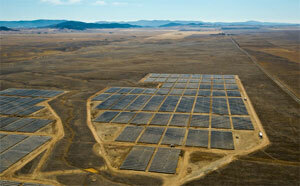 It also owns the world's second-biggest solar plant - the 550 MW Topaz Solar Farm  under development in California. And it has a 49% stake in the 290 MW Agua Caliente  solar project in Arizona. Since it began acquiring renewable energy projects last year, MidAmerican Renewables  has quickly grown to an 1830 megawatt (MW) portfolio in wind, geothermal, solar and hydro. When current wind projects are completed, it will have 2284 MW in that sector alone, making it the largest owner of US wind farms by an investor-owned utility. The utility also recently agreed to retire seven old coal plants . Antelope Valley Solar Project is different from another nearby - Antelope Valley Solar Ranch , under construction by First Solar. Los Angeles County recently halted the project because of health issues caused by dust.